Published: Aug. 2, 2012 at 09:45 a.m. Updated: Aug. 31, 2012 at 02:34 p.m.
New York Jets center Nick Mangold has weightlifting in his blood; his sister, Holley, is a top Olympic competitor. 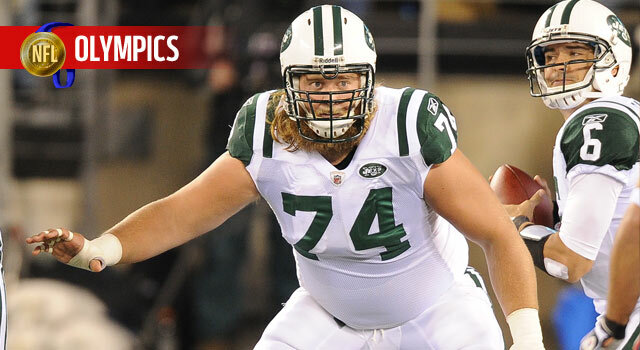 Mangold is one of the NFL's most dominant offensive linemen. He has excellent awareness and balance, but his calling card is a combination of power and strength. Those traits apparently run in the Mangold family; Nick's younger sister, Holley, is a member of the U.S. women's Olympic weightlifting team. The NFL Scouting Combine is a very valuable scouting tool. During the course of a week, scouts are able to test NFL prospects in several different exercises and drills. One of those tests involves seeing how many times each prospect can lift 225 pounds on the bench press. At the 2011 combine, Paea set a new record by pumping out an unbelievable 49 reps. Amazingly, he was disappointed that he failed to reach 50.